Democratic Alliance (DA) leader Mmusi Maimane says job creation remains key to rebuilding South Africa’s economy. 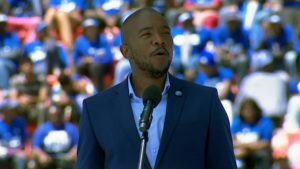 Maimane is addressing thousands of supporters at the Rand Stadium in Johannesburg for the party’s manifesto launch on Saturday. Maimane says his party will ensure that at least one person in every single household in the country is employed. He added that maximising key performing sectors is central to the reforming South Africa’s economy. “We will rebuild our economy by maximising the sectors that are key to job creation – sectors like Manufacturing, Agriculture and Tourism…It cannot be that four out of every ten South African households do not have a single income. If we can put at least one job in every home, it will completely transform these households. The freedom and dignity that an income brings is hard to describe to someone who has never had to worry about food,” says Maimane. Outlining the party’s successes on curbing unemployment, Maimane says over 100 000 jobs have been created over the past two years in Johannesburg since the party took over the metro. The DA leader also pledged to assist small business owners and entrepreneurs. Maimane also says the party will pass a ‘Jobs Act’ which will offer tax incentives for people to open businesses that create jobs. The post WATCH: Job creation key to reforming SA’s economy- Maimane appeared first on SABC News – Breaking news, special reports, world, business, sport coverage of all South African current events. Africa's news leader..